HAPPY HEART DAY TO EVERYONE! Typically, after Valentine’s the phones start ringing pretty madly and today is no exception. Whether I will be working with some of these couples, or not, I do love to hear all the engagement stories. I’ve certainly heard the range over the years, from the very elaborate and precisely orchestrated to sweet and simple. They all have the same sentiment and that is what mostly matters (along with the perfect ring. Ha!). So I will devote this blog entry to some useful tips. You just got engaged, now what? First of all, breathe. Take it easy, if only for a moment. This brief moment in time (the engagement period) will pass quickly and soon enough you will be busy with guest lists, budgets, seating arrangements, and calligraphy samples. Once you’re taken a moment to take in your new status, there are some things you will want to consider and discuss with your fiancé and families. Date – Figure out what time of year works for you and how quickly, or slowly, you would like to move forward with the planning/decision making. Once you have a general idea of the date (and definitely think about the weather in your region when making this decision), choose a couple of dates and run them by the important people in your life, to be sure there are no major conflicts. In actuality, the more flexible you are with the date, the easier it will be to find a location. Budget – No one usually enjoys this topic, but it is one worth bringing up early on. Seems like so many people I speak with have no idea how much weddings cost, and there really is such a range, depending on what part of the country you are in and what your expectation are. Nonetheless, I believe in clarity and communication with this topic. Speak to all the parties who may be contributing and see what you have to work with. There is no sense in checking out a facility that is out of your price range, or find out the photographer you hired is twice what you should be spending. Once you have discussed the above, do enlist the help of a professional if you can afford it. Most of the time I find, you can barely afford not to. 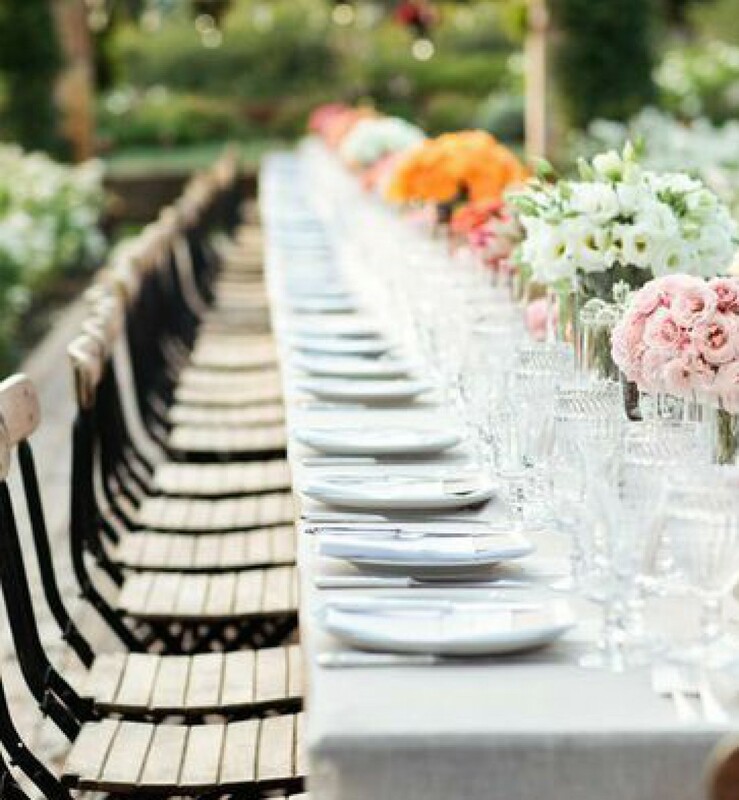 A seasoned wedding planner can help you make smart choices along the way and avoid what could be costly mistakes. There are many wedding planners out there these days and there is a range in terms of their fees. Happy Valentines Day and Happy Engagement to all the new brides and grooms out there. Hello and happy 2011, albeit a bit late. It has been a while since my last blog post and I have so much to report, so brace yourselves. We wrapped up 2010 with a spectacular destination wedding weekend in Cabo San Lucas, Mexico. More to come on that soon, I just got some great photos. In the meantime, here is my big news to start 2011, which I predict to be a fantastic year of inspiring work. Ok, drum roll…. 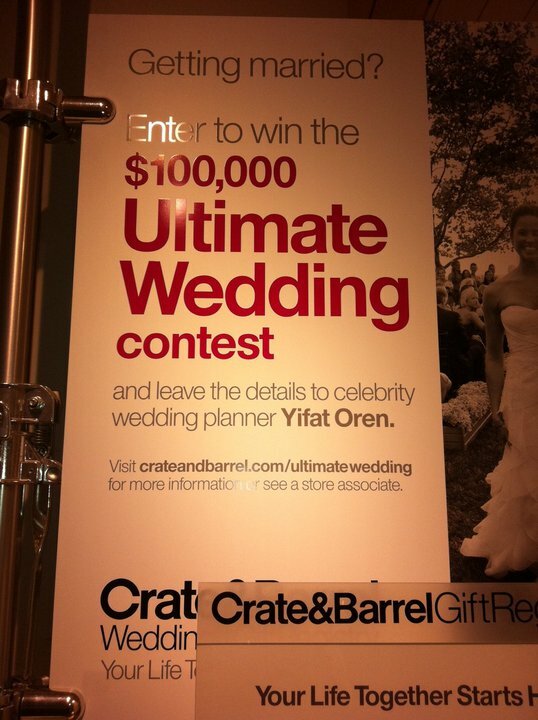 today, Crate & Barrel is announcing their 2011 Ultimate Wedding Contest with celebrity wedding planner Yifat Oren (that would be me). First of all, I think this is an unbelievable contest; can you imagine your dreamy wedding paid for by Crate & Barrel and designed by me? I am so excited to see how the next few months unfold. There will surely be many interesting entries to read, then voting, and finally a winner announced and a wedding to plan. For anyone not in the loop, Crate & Barrel’s Ultimate Wedding Contest is a chance for one couple to win a $100,000 wedding planned by a fancy wedding planner to the stars (me again). How great is that? I mean, who wouldn’t enter? Over the years I have planned some pretty spectacular weddings, but I have to say I am super excited about this opportunity. Why, you ask? Well, because Crate & Barrel is a retail brand that I have loved for years. Much like me, they don’t rest on their laurels. Rather, they invent and reinvent how we all decorate our homes and set our tables. Imagine the possibilities of our collaboration. So, please enter and tell all your friends to enter www.crateandbarrel.com/ultimatewedding. I am looking forward to reading the entries and of course helping choose the lucky couple. Do check back and read my blog as I will be posting tips and updates.